CONTEXT: Current breast-feeding rates fall short of the recommendations set forth in Health People 2010. 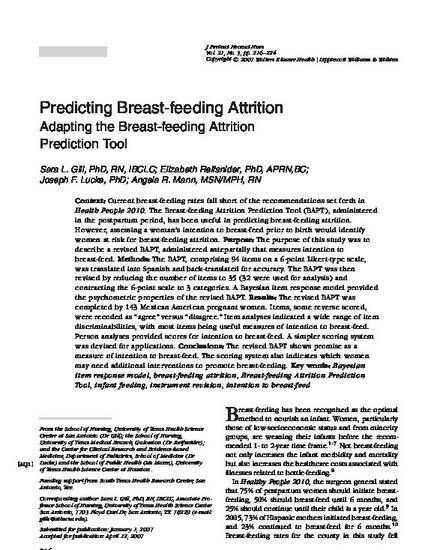 The Breast-feeding Attrition Prediction Tool (BAPT), administered in the postpartum period, has been useful in predicting breast-feeding attrition. However, assessing a woman's	intention to breast-feed prior to birth would identify women at risk for breast-feeding attrition. PURPOSE: The purpose of this study was to describe a revised BAPT, administered antepartally that measures	intention to breast-feed. METHODS: The BAPT, comprising 94 items on a 6-point Likert-type scale, was translated into Spanish and back-translated for accuracy. The BAPT was then revised by reducing the number of items to 35 (32 were used for analysis) and contracting the 6-point scale to 3 categories. A Bayesian item response model provided the psychometric properties of the revised BAPT. RESULTS: The revised BAPT was completed by 143 Mexican American pregnant women. Items, some reverse-scored, were recoded as "agree" versus "disagree." Item	analyses indicated a wide range of item discriminabilities, with most items being useful measures of intention to breast-feed. Person analyses provided scores for intention to breast-feed. A simpler scoring system was devised for applications. CONCLUSIONS: The revised BAPT shows promise as a measure of intention to breast-feed. The scoring system also indicates which women may need additional interventions to promote breast-feeding.